A friend of mine recently created lovely neat channels on the door to the family pantry to hold Nespresso pods. While the work was fabulous, I was saddened by the implied waste. Nespresso pods are one of the most costly ways to consume coffee, and - despite my friends protesting that the pods are recycled - I am suspicious about how much recycling actually happens, despite Nestlé's green claims. Recycling pods provides two choices: we either take the pods to a drop-off centre and the people at the centre clean the coffee out and send the aluminium for recycling; or that we clean the pods out ourselves and put the cleaned pods in with the aluminium cans with our local recycling scheme. Many people don't do either, and just chuck them out with their rubbish. The aluminium consumed in every pod can't be turned into anything else down in our neck of the world... and people seem to drink four or five pods-worth of coffee a day. That's 1300 or 1600 pods per consumer, per year! Staggering. The website, One Million Women, state that globally 55 million pods are used per day ...and suggest that few are fully recycled (14 April 2007). Nestlé says that pods are recyclable, and their PR video looks all well and good (here), but the video script carefully doesn't say that the pods actually get recycled in New Zealand. This omission is all it takes to allow a difference between the possibility of recycling and the act of actually doing so. Most of our 'recycling' in New Zealand, once collected, is simply landfilled because our overall quantities are too small to do anything with, and the cost of collecting it into a large enough cluster to then ship it offshore is prohibitive. China used to take a lot of our plastic, but no longer does: they have put restrictions in place as to what can be imported. To the best of my knowledge, the only thing that is consistently recycled is glass (often used for base-course - after being broken up and rumbled - on our roads). Some paper gets reused for things like egg cartons, but a lot is not suitable for reuse with our level of manufacturing and - again - logistics and cost. About half of our aluminium is intended for recycling: but it cannot be done in this country. As far as I am aware, there is no re-smelting plant in New Zealand for any type of aluminium: so aluminium intended for recycling - mostly industrial and commercial product - is shredded and goes to Australia or Japan if the cost:benefit stacks up. From student projects undertaken into waste management which I have supervised, I know our local collection centres landfill almost everything other than glass and some paper. However, our councils wisely keep us in the habit of recycling so that when there is finally a buyer for the waste we produce, the systems are already in place, so supply will be seamless. However, with Nespresso pods, I smell 'PR'. I suspect that pods don't get fully recycled in New Zealand. You can buy bags to post your pods back, or you can drop your spent pods off at selected florists. The coffee MAY get emptied out at the florists', but then the pods would have to be fully cleaned and the put in their recycling. Will all pod drop-off florists' put the aluminium in their recycle bin? Will their council have access to aluminium recycling collection points? Not in the South Island: apparently the Cook Strait is the most expensive piece of water in the world to cross. I would imagine that most aluminium goes to storage to wait better economic times, or to straight to landfill if the collection points are strained. We don't manufacture Nespresso pods in New Zealand, and the cost of return shipping would outweigh any possible benefit: even if the pod aluminium goes to Australia. The logistics and costs of getting all those pods into one place in New Zealand to then ship them to Australia would be much greater than any actual value of recycling, and I cannot imagine that a company with Nestlé's - lack of - reputation for green practices would willingly take on the cost. As a result, I suspect green-washing and consumer PR on the part of Nestlé. A gap between promise and action. The best recycling is one that we don't need in the first place. 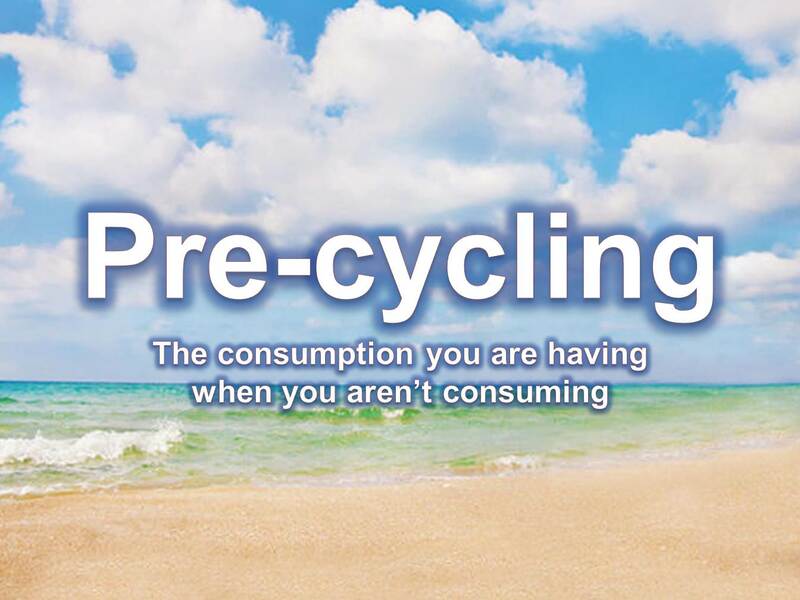 There is even a name for this now: pre-cycling. This is a bit like a Clayton's (here) for any of you who remember watching the TV ads when you were a short person: "the drink you are having when you aren't having a drink" could become the "the consumption you are having when you aren't consuming". Rather than a pod machine, think instead about buying one where you grind your own beans, and only heat enough hot water for the coffee head itself. That is what our machine does (it's an Ascaso), which has been going now for thirteen years with a few minor repairs. However, if you really want to go green, apparently instant coffee has the lightest footprint - ugh! But that is a step too far for me.